I’m pretty sure we all played Bop It as a kid. You know – the toy which would tell you to do things – twist it, pull it, whatever, and increase the speed to the point your brain and hand-eye co-ordination could no longer keep up and you end up doing completely the wrong thing and embarrassing yourself with all your friends. 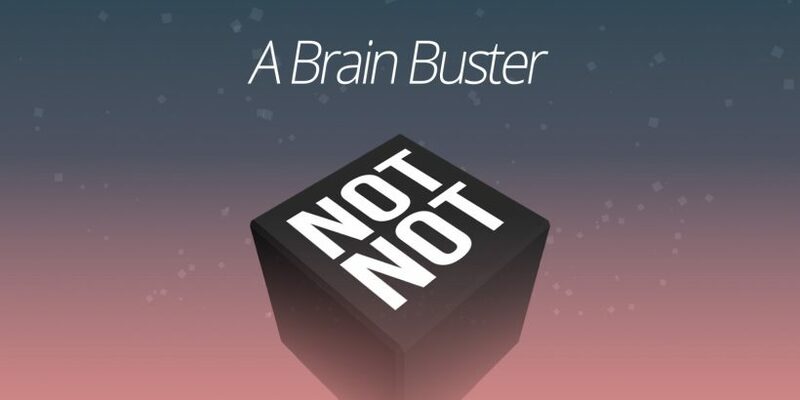 It was great fun, and that’s something that the team behind Not Not – A Brain Buster have noticed, and they’ve come pretty close to emulating it in this fast-paced puzzler. Processing two instructions at once is harder than it looks. Not Not has you in control of a character on a cube – though it’s only the square facing you that you need to worry about. 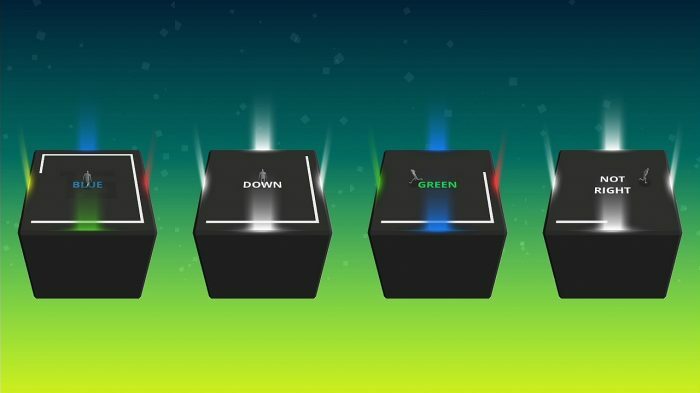 The game presents sets of levels of varying difficulty at multiples of ten in length, with sets comprising three different numbers of steps each individually tackling a new theme. The puzzle is thus – you’ll see a command appear on the face of the cube facing the camera, which might tell you to go right, up, stay where you are, or whatever, and then a countdown timer whizzes by prompting you into action. Follow the instruction correctly and you’ll shift the face of the cube to the next instruction, and the countdown will start again. But that’s a very simplistic version of the challenge that Not Not poses. 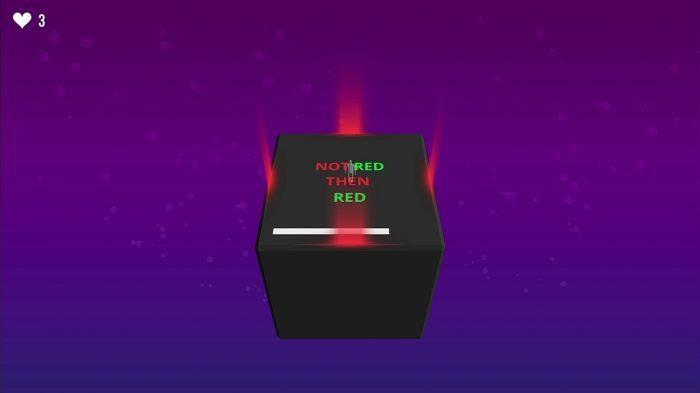 Rather than simply telling you a direction to move, you will soon find levels which illuminate the sides of the square facing you in a certain colour, and the instruction will tell you to head for that colour. It gets more complicated – ‘not’ levels tell you not to go towards a direction or colour, and of course the brain registers the noun before the ‘not’, so you’ll quickly get caught out. Not taxing enough on the old noggin? Not not levels are included, as well as ‘not not not’ – it’s a heck of a challenge to get your brain working fast enough to figure out the instructions before moving. ‘And/or’ instructions blend combinations, but some are simply impossible, meaning you should just stay where you are, and this punishes you hard for just pushing a direction out of instinct. … no matter how many friends you’re playing with! The challenge comes from reading the instruction at lightning speed, processing the information and then reacting accordingly before the unforgiving countdown timer splatters your character into a million pieces. But it’s certainly a satisfying challenge in that. Speaking of challenges, there is a Challenge Mode section, with an Endless game pushing for high scores and rapidly upping the pace every few levels, and that comes in Normal, Hard and Extreme difficulties. 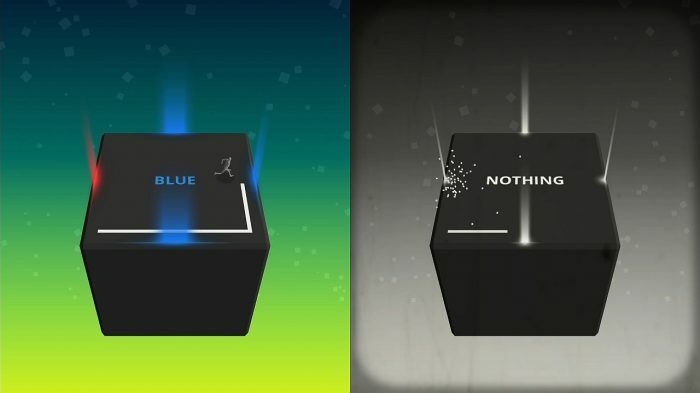 Not Not is probably the sort of game which would be great for training the brain – don’t quote us on the science though. What it certainly will do is test your brainpower under pressure – and that makes for a strong puzzle experience to us. Dirt cheap, Not Not is a good, fun, simple yet immensely challenging eShop title. Pick it up.